Recently I spent some time with a friend who has 16-month old triplets. Like most 16-month olds, they are in perpetual motion—over, under, around, and occasionally through nearby adults, furniture, and toys. Watching the three of them explore the world is a perpetual motion delight. This week I watched one child play with a Fisher Price Doodle Pro—a bit like an Etch-a-Sketch with a stylus. He is just beginning to be able to control the stylus to make marks on the board when he wants to. For a while he happily experimented making marks on the board. But then he decided to try something else. I watched as he took the stylus from the toy and experimented with poking it on other things. If he poked the chair, did it make a line? How about a book? How about my sweater? Occasionally he’d return to the toy to reaffirm that touching there did make a mark—perhaps to make sure it wasn’t broken. Over and over I watched him make hypotheses and try them out with both intensity and delight—at 16 months old. It reminded me of another friend’s child who, at about the same age, did something similar when presented with magnetic activities that stuck on the refrigerator. He enjoyed the activities for a while, and then disappeared, returning with armloads of toys, trying each one in turn to see if anything else would stick. I watched the same toddler, as a beginning walker, move back and forth from carpeted to uncarpeted rooms trying different motions—jumping, rocking back on his heels, etc.—apparently working to understand how walking differed on varied surfaces. Those toddlers really were miniature scientists at work. Thinking about these explorations reminded me of some of the work of Dr. Alison Gopnik, who explores the learning and creativity of young children. In study after study, she found that when given the chance to explore, young children could make hypotheses and draw conclusions with logic that rivaled (and sometimes exceeded) that of adults. However, if given direct authoritative instruction, they simply imitated the adults, without exploration or discovery. Sometimes that is a good thing. If I tell a young child not to run in the street, I want them to imitate that behavior exactly as I demonstrate it. 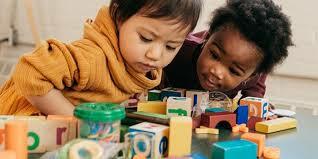 But for much of life—and certainly for the play life of young children—more important learning will come through experimentation and exploration. Our job as adults is to create safe spaces for that to happen—and not just for toddlers. Don’t we all need to explore the world with awe and interest and flexibility? I’m still trying, many decades past toddlerhood. There are lots of ways to think about such exploration, but for the moment I’m thinking about holiday gifts. Many of us—unless we are early shoppers—are moving into a season of gift giving. As we do, let’s think about things that can be used more than one way, explored, and experimented upon. If something needs too many directions, perhaps think twice, or it may become the ill-fated gift that is less interesting than the box! That is certainly true for toddlers, but perhaps our much-loved adults need encouragement to explore even more. If you’d like to hear more about Dr. Gopnik’s work—and see some adorable video of young children, take a look.